Royal Decameron Montego Beach is located 5 minutes from Montego Bay Airport on the North Coast between the Airport and downtown. This renovated property caters to honeymooners, couples, singles, children 12-17 years and golfers. 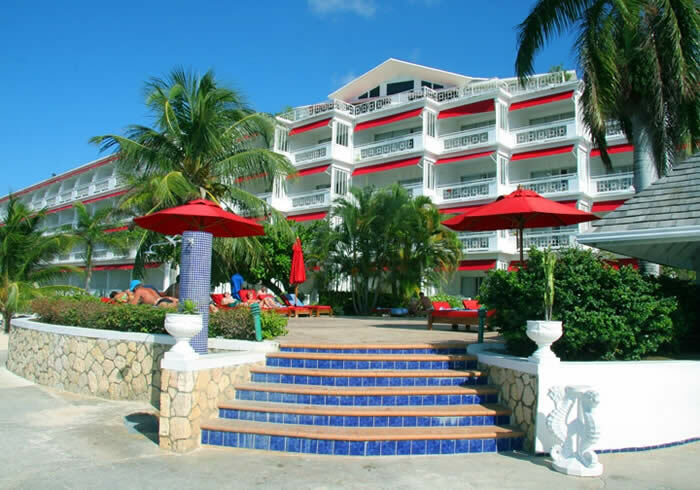 The Caribbean borders this beachfront Resort and lush tropical garden will please clients seeking a private beach, great service with a true Jamaican ambiance. Four golf courses within short driving to select from including the Tryall Golf Course, former home of the LPGA Tours, Jamaica Classic and the Johnnie Walker World Championship.All inclusive property includes the following - welcome cocktail, all meals served in buffet style at the main restaurant, unlimited soft drinks/soda and natural fruit juice. A variety of alcoholic beverages, beer, liqueur and cocktails. Wine available for lunch and dinner, daily activities programs by the pool, unlimited non motorized water sports. Reservations require full stay credit card deposit at the time of booking and your credit card will be charged by International Vacations. We require a phone/fax or email address at time of booking to receive your voucher from International Vacations.This hotel is managed by International Vacation. Any inquiries should be directed to their customer service department at 1-888-431-2866. ***PROPERTY NOTES***Cancel Policy -For bookings up to 14 days in advance of arrival - cancel 15 days prior to arrival date to avoid penalty of 100 percent of stay.For bookings made 15 to 30 days in advance of arrival - cancel 31 days prior to arrival date to avoid penalty of 50 percent of stay.For bookings more than 30 days in advance of arrival - cancellation will result in a penalty of 2 nights room change.Deposit Policy - For bookings up to 14 days in advance of arrival - a deposit of 100 percent of stay is required at booking.For bookings made 15 to 30 days in advance of arrival - a deposit of 100 percent of stay is required at booking.For bookings more than 30 days in advance of arrival - a deposit of 100 percent of stay is requried at booking.Guarantee Policy -For bookings up to 14 days in advance of arrival - guarantee to valid form of payment is required at booking.For bookings made 15 to 30 days in advance of arrival - guarantee to valid form of payment is required at booking.For bookings more than 30 days in advance of arrival - guarantee to valid form of payment is required at booking.